Manny Pacquiao's mother or what everyone calls her Mommy D. said that the still undefeated American Champ 'Floyd Mayweather' is like a rat because what he just did is run. 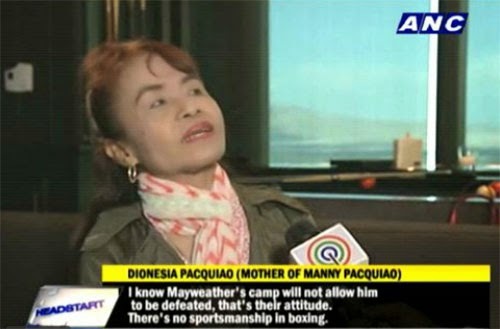 It may be true that his son lost the fight, but Mommy D is still proud of him because he may not won but he able to gain the hearts of many people who watched the fight. The Battle of the Century (Mayweather-Pacquiao Fight) was held at MGM Grand in Las Vegas on May 2, 2015. Comments or suggestions about "Mommy Dionisia Pacquiao comments to Floyd Mayweather" is important to us, you may share it by using the comment box below.